99 AED for a 3 course meal including a glass of wine. Really? How does that work? Even with all the 241 vouchers that I’ve used, paying less than 200 AED for two people, for entree, mains, dessert and wine….. is unheard of. What more in a nice joint like that of the Maine Oyster Bar & Grill. Self-explanatory….. take your pick from this menu. It was that cold, gloomy week in Dubai when the sun decided it was happier staying behind clouds. 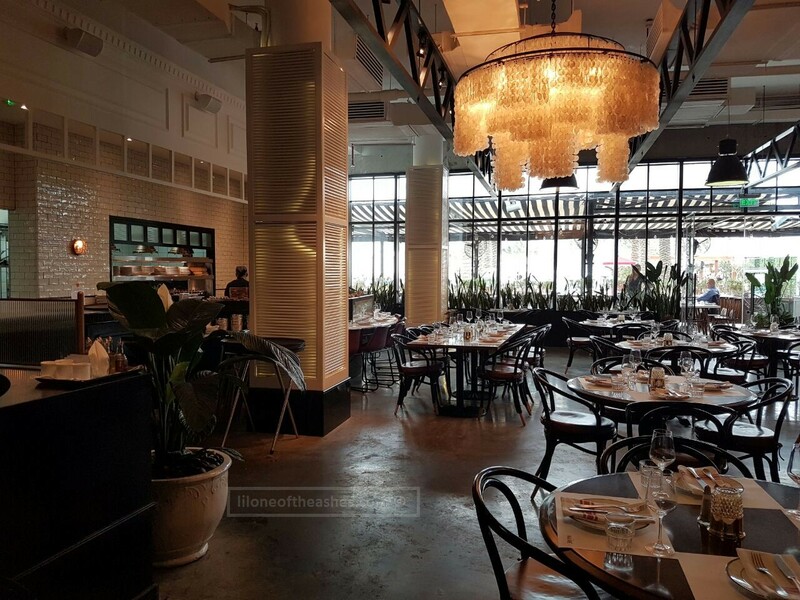 A perfect time for lunch at Maine, as other than a few tables occupied in their outdoor terrace, it was literally just us indoors. Quiet lunch with mum, hooray. We were first served bread from the kitchen, which we both devoured a bit too quickly as we had come to the restaurant hungry (suggest you do the same as well! the come to restaurant hungry bit…). I started with The Maine Clam Chowder, which came to the table hot, creamy…. just the right amount of salt. Mum’s red quinoa came, served with tomatoes, avocado, drizzled with a light honey lemon vinaigrette. We shared the entrees, and it was a nice combination of something heavy with something light and refreshing. Paired with a glass of wine each, it was a perfect start to an otherwise dull weekday afternoon. Honestly by the end of the entree, as we had had too much bread, we were both quite full. My medium-well wagyu plank was served with bearnaise sauce, and hand-cut fries to the side. I have to apologise, this flatlay photo doesn’t do the steak justice.. it was thick, a generous size, tender inside. I would have preferred my fries with less grease… that’s just me. Mum’s spring chicken, also a generous portion served with asparagus and cherry tomatoes… mash potatoes underneath. One of those not-so-memorable dishes… fills you up, keeps you happy. By the end of the mains, which we both struggled to polish off, came the biggest decision : Dessert, yes or no? We had to try it. It was sticky date cake drizzled with caramel sauce : delicious, but much too sweet and heavy for the afternoon so we asked for it to packed away. Good thing that we did, as I had it that evening, with a cup of tea, and it was perfect. What could be better? 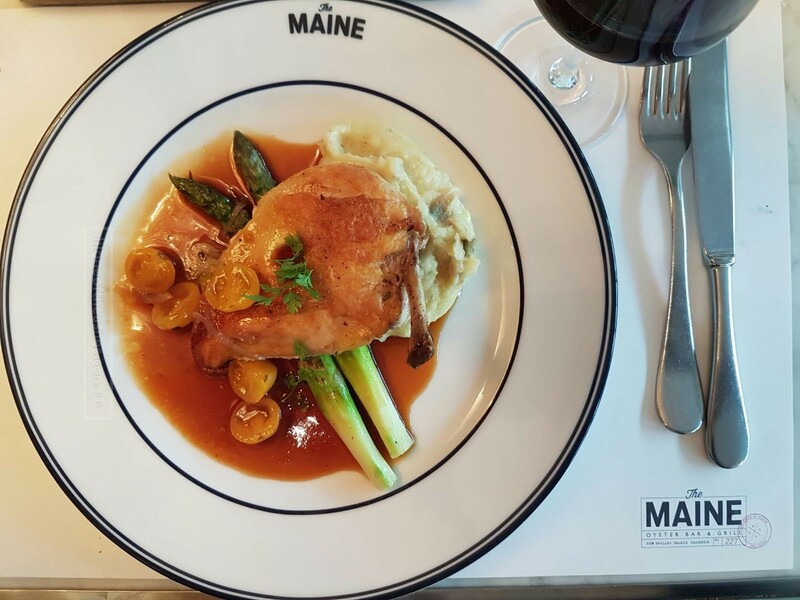 When asked what was Maine’s specialty, or what they recommend from the set menu, our staff was slightly clueless. The odd thing was they knew we were there to review the menu….. or maybe he didn’t. Don’t like the entrance… though there’s nothing they can do about it. I just don’t get how Doubletree Hilton JBR has been designed… with the main hotel lobby accessible through an odd ramp, and the food outlets hidden within the carparking area (Ramusake, Maine)…. must be a feng shui thing?? Would I recommend the lunch set menu to others? Disclaimer : We were guests of The Maine Oyster Bar & Grill to review their business lunch menu. Thoughts are our own, though it is entirely up to you to judge. OMG – that deal looks incredible! Even though I usually avoid the Marina, this deal might just be too good to pass up. Let me know if you’re ever up for a trip back — I’d be happy to meet you.